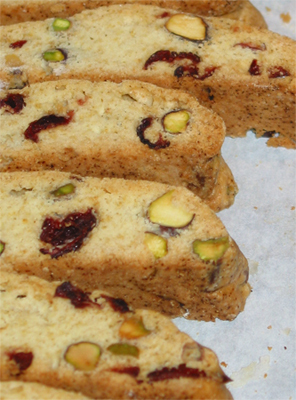 I posted this recipe a long time ago in my previous blog that I shared with my brother, but thought that these biscotti were deserving of a repost here on Bon Eats. I’ve made quite a few biscotti in my days (not at all an influence from all those Italian classes I took in university!) but these have to remain one of my top favourites. 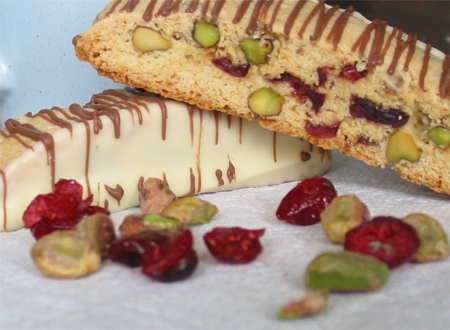 The tart-sweetness of the cranberries plays off the buttery crunchiness of the pistachios. 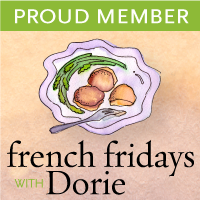 And I love the use of olive oil in this recipe—you can subtly pick it up in the cookie. And can I just say how gorgeous these look out of the oven, jewelled in Christmas colours? I mean, how can you go wrong with a cookie that totally bedecks itself in the holiday spirit to begin with, right? Add a little final touch with some white and milk chocolate and you’ll have a hard time convincing your friends that no, you really did bake them and didn’t pick them up from the store! Tomorrow I’ll be featuring my favourite from this year's Christmas Cookie Round-Up—Raspberry Cream Thumbprints! In a large bowl, mix together oil and sugar until well blended. Mix in the vanilla and almond extracts, then beat in the eggs. Combine flour, salt, and baking powder and gradually stir into the egg mixture. Add the cranberries and nuts, mixing until just combined. Divide dough in half. Form two logs on a cookie sheet that has been lined with parchment paper. The dough will be very sticky, so flour the sheets with some flour and wet your hands with cool water to handle the dough more easily. Bake for 35 minutes in the preheated oven, or until logs are light brown and firm. Remove from oven, and set aside to cool for 10 minutes before cutting the logs on the diagonal into 3/4 inch thick slices. Lay on their sides on parchment covered cookie sheet. Bake approximately 12 to 15 minutes on each side, or until dry. Cool completely. For a finishing touch, you can dip or drizzle biscotti with melted white and/or milk chocolate. Posted by Bonita at 3:00 p.m.
Natalie MacLean December 19, 2009 at 6:46 p.m.
wonderful blog Bonita! Would you please e-mail me via my site please?